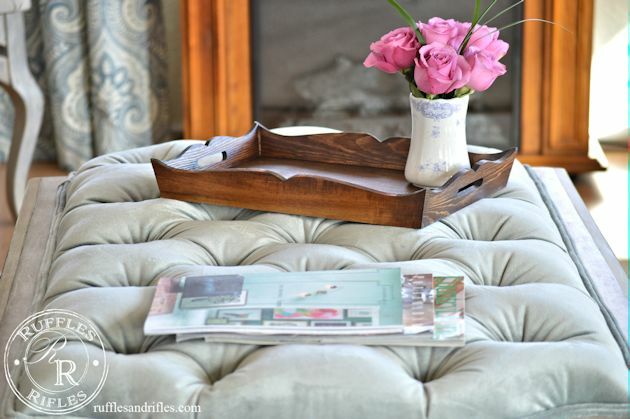 If you would remember when I posted my tufted ottoman back in November, I was looking for the perfect tray to accompany my next to perfection ottoman. 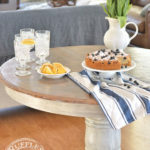 I love everything about the ottoman, I use it daily, and it makes me smile with its beauty, but I have been on a look out for the right tray to provide needed stability for drinks and what not when it comes to the needs of a coffee table. I found several trays I liked, but for $35-$60, they didn’t seem that amazing to me. So I looked at thrift stores, and I kept my creative thinking cap on. Til one day a couple of weeks ago, I happened upon this pretty, curvy, unfinished wooden little tray at JoAnns, of all places. I picked it up, and it said, $9.99, which I was pleased with in comparison to other trays I liked. I hope you all know to never buy anything at full price at JoAnns, because it will always go on sale, or there are coupons available. In this case, it was 40% off, so the delectable little tray was therefore only $6! I took it home, and waited for a couple of sunny afternoons where we have been reaching a whopping 45 degrees, and I stained the dainty little tray with two coats of Minwax’s Provincial. I then added some Miss Mustard Seed’s Hemp Oil for protection. And I dare say, it is the perfect compliment to the ottoman, and it practically serves a purpose. 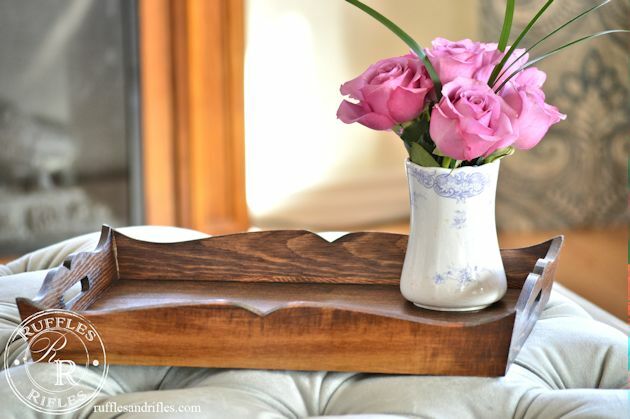 It’s not a mighty serving tray by any means, but I don’t need it to be, it simply needs to provide steady services to drinks (or a petite bouquet of roses). I love the little curved edges. Its just so sweet. 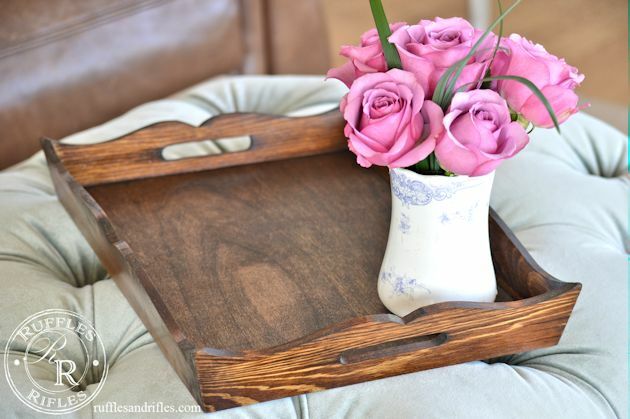 And so yes, the tray was only $6, and the roses were $8, but you know, I think Courtney at French Country Cottage has started rubbing off on me. There’s just something about fresh flowers that make a photo pop. Something about the life giving color that makes me kind of giddy. My boys have started rolling their eyes at how I stop by the floral section every time I go to the grocery store. But I am falling in love with flowers all over again. Something about God’s creation, it’s like eye candy to the soul. 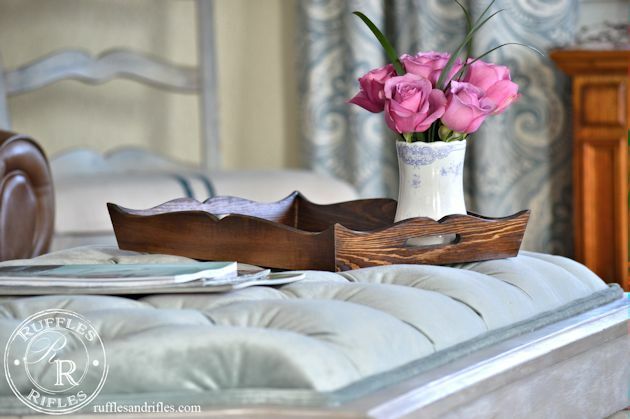 I am nearly done with the tufted ottoman tutorial, so stay tuned, hopefully next week (fingers crossed). I am with you on the fresh flowers, for sure! 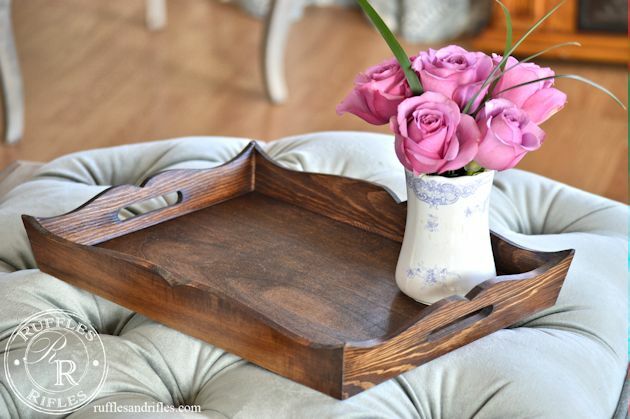 Love the tray and the flowers! ? 🙂 We are girls aren’t we! Not to mention, vacationing in warmer climates seems to draw the need for flowers out even more! Ha. Thanks for enjoying my pretty things. You’re ottoman is just lovely! 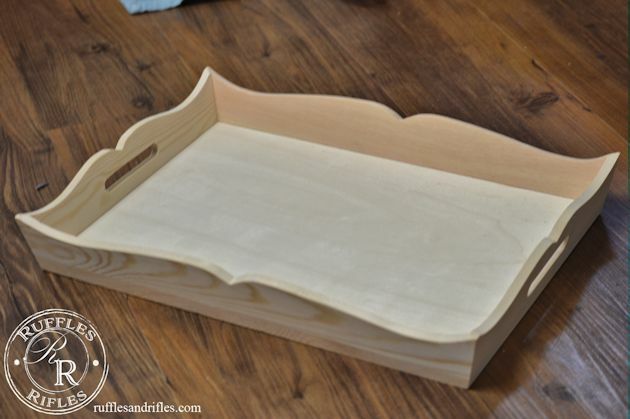 And I have a thing for trays…I could put them everywhere! Tulips and Allium is starting to pop up in my beds. A little crazy around Alaska lately. LOL. Your tray turned out beautifully, Cheryl. I hope you link up with Thursday Favorite Things Blog Hop. I’m so silly. Ha! You did link up. 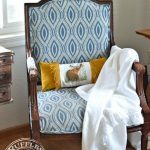 I read this in my email, not from the Thursday Favorite Things Blog Hop. Pardon my oversight, I’ve been awake since 4 a.m. Awesome steal for this tray! 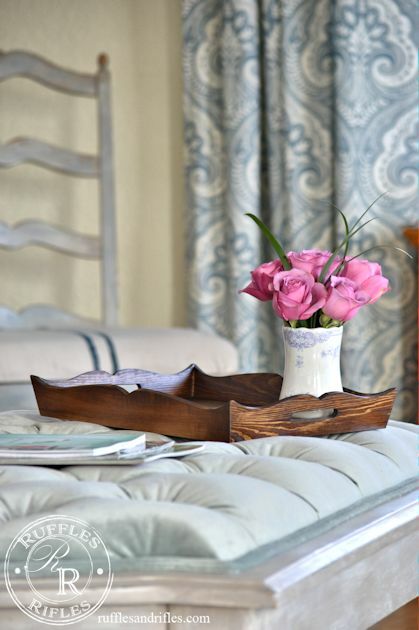 It looks so good on that beautiful ottoman! I hope you have a great weekend!